This story is the second part in a three-part series about our three 2017 Market to Market Relay Iowa Spotlight Teams. For the descendants of the Boysen family, traditions matter. And when your family suffers a tragedy, they matter even more. That mentality is what has brought the Boysen Strong team back to Market to Market Relay Iowa year after year. Boysen family member, Russ Deihl, was discussing the New York Marathon in a New Jersey bar when some Iowans first told him about the M2M Relay. 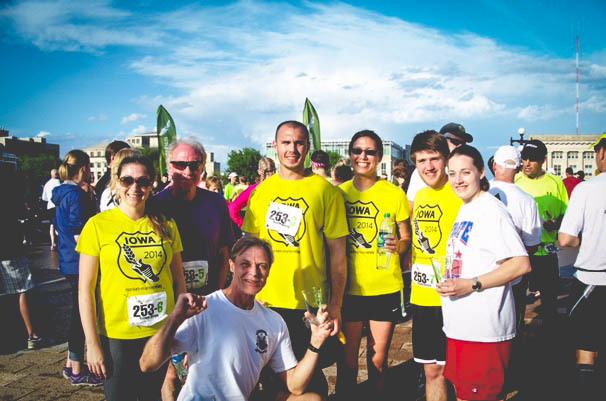 Having discovered an avid love of running late in life, this seemed like a perfect excuse to get his family together back in Iowa and do something fun and active. This is how they’d engage the younger generation, he told them. So, Russ made it happen and the Boysen Strong team took on their first Running Road Trip in 2014. They also made a new tradition of gathering for a family meal the night before the race – Russ’s sister Rose’s delicious lasagna on the menu. Tragically, the summer following their first race as a family, Russ suffered a swimming accident and was paralyzed from the neck down. What would happen to their fledgling tradition with their team leader unable to participate? They’ve even extended the tradition to friends of the family. “I love adding new people and seeing the determination inside them come out on relay day,” Jack added. And while Russ can no longer run in the race, the family runs for him. He’s there in spirit – and often via FaceTime video calls. They still gather at Rose’s house for a pre-race meal and Rose and Mark drive the team van year after year. Everyone gets involved somehow. So, was Boysen Strong back for this year? Or course. Will they be back for next year? Of course. With this commitment to tradition, and running for Russ, there’s little doubt – the Boysen family will never be anything but strong.